Ngarluma Traditional Owner Kerry Churnside extends a welcome in language to the visitors of Ngaluma Country in the Pilbara region on Western Australia’s rugged North West Coast. A Welcome to Country is a practice that has taken place for thousands of years in Indigenous Australia and this particular welcome is one of many available to view on the Welcome to Country iPhone app. 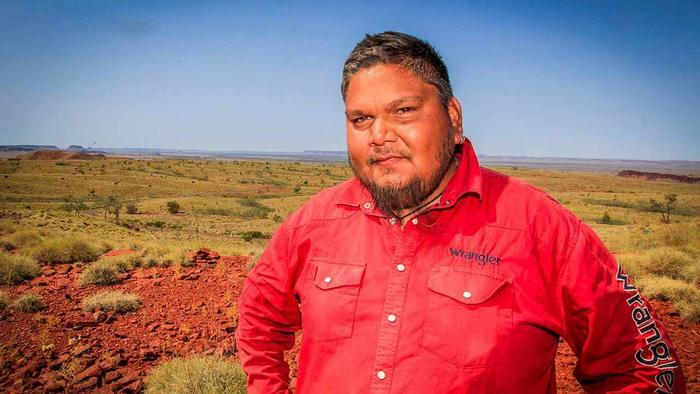 Developed by Ngarluma man and Founder of Weerianna Street Media Tyson Mowarin, the app fuses age-old culture with modern technology, with the aim to educate the user on the Traditional Owners’ culture and heritage protocols right across Australia. Created as part of Weerianna Street Media’s Digital Dreamtime Project, he said the use of technology offers another platform for people to engage and learn about the many cultures and language groups that exist in Indigenous Australia. “The Welcome to Country app can be used by tourists, schools, employers, government departments, by tourism bodies and many other user groups and individuals,” he said. “We found ways to offer cultural information using cutting edge technological tools and we made sure it was accessible, well promoted, well researched and presented. The use of technology makes it easier for people to engage with our project and learn about our region, and other places too.” Mr Mowarin said. Download the app and listen and learn from the Traditional Owners of the land you are standing on here. The Culture and Country category celebrates the use of technology to capture stories and share culture. Examples include individuals and community organisations that have used AR and VR to map sacred sites, bush medicine and manage the environment, an organisation that has developed a language application or a corporation that has utilised an Indigenous supplier.